As you may have noticed, I've been on a bit of a skincare journey these past few months. 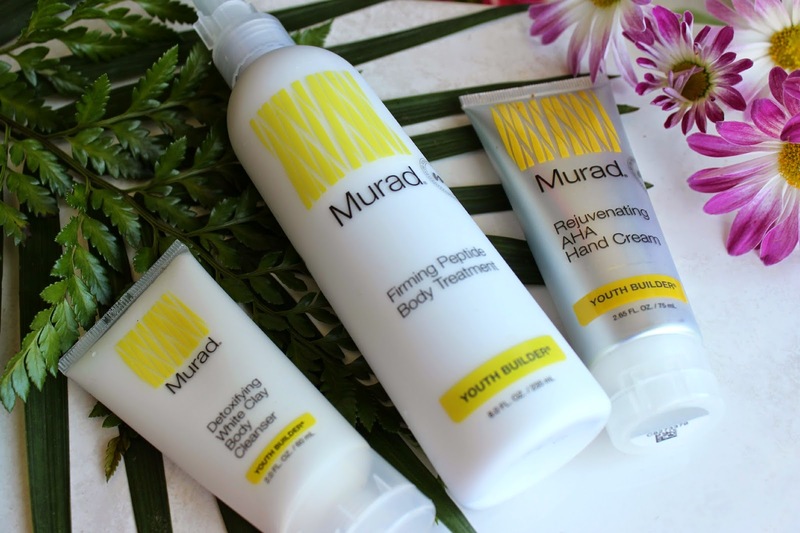 While I've been focusing primarily on my face, I was more than willing to give some body products a try when I was kindly contacted by Murad Canada. 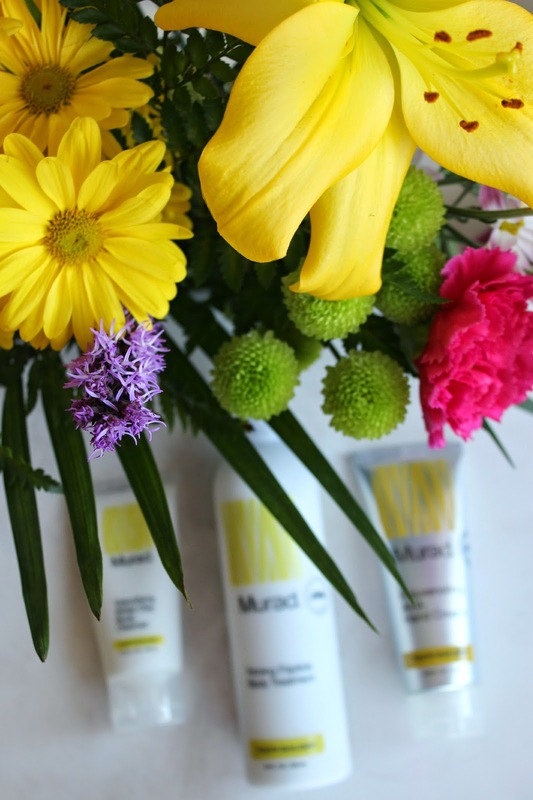 Last week, I received the Mothers Day Bodycare Set, which includes the Detoxifying White Clay Body Cleanser, the Firming Peptide Body Treatment, and the Lightweight AHA Hand cream, which is available for $75. Detoxifying White Clay Body Cleanser: Of all the items in the kit, this is by far my favourite. At first, I was a bit skeptical of it. I'm someone who uses The Body Shop Body Polishes religiously, and the thought of using a creamier product in the shower instead of a harsher exfoliant seemed . . . well, strange. But I noticed a huge improvement in the appearance and feel of my skin after just one use. It's a stimulating cleansing clay, formulated with Ginger Root extract, Safflower and Sunflower oils, that works to remove oil and surface impurities while leaving skin moisturized. The Keratosis Pilaris (also known as the ugly red bumps and dry skin that a lot of people have) on my arms has really seen an improvement. There are a lot fewer bumps, and the redness of my skin is greatly reduced right after I hop out of the shower. I also suffer with a lot of acne on my chest and upper back, but I've found even that has greatly reduced since using this product on a near-daily basis. Overall, I think this product is amazing if your are looking for a gentle wash to soothe and soften skin. Firming Peptide Body Treatment: I really liked this product as well. You get a very generous amount of product in this gift box, and the pump-action makes it really easy to distribute just the right amount of product. The product itself is a relatively thin formula (compared to something like the Bliss or The Body Shop Butters that I love). It absorbs into the skin very quickly, but leaves a slightly greasy residue on the skin. But that is how the product is supposed to work: defined as a creamy moisturizer, the rich blend of amino acids melt into a light oil, featuring their coveted Glyco Firming Complex, and works to ensure that skin retains its moisture while restoring a youthful appearance. I also loved the longevity of the product; with a lot of other moisuritzers, they feel really thick and effective for the first few hours, and then by mid-day, you're clawing at your persistently itchy legs and arms again. But with the Firming Peptide cream, the product lasts all day, leaving my body very soft, without the thickness of a traditional moisturizer. As for the firming properties, I think I will need to give the product some more time before I make my decision on that. Rejuvenating AHA Hand Cream: This is the only product that I'm not a fan of, for two reasons. First, I've been dealing with a lot of dryness and irrataion in my hands, even since my bout of eczema earlier this winter. And there is something in this hand cream that is reaggrevating it again. I've noticed a rash developing across my knuckles and along my wrists since using it (I'm guessing it's the botanical extracts, which can sometimes irritate sensitive skin). Naturally, I've shipped it over to my mom for her opinion, but the verdict is still out. As for the formula, it's quite a thin consistency, and is described as a silky, quick-absording moisturizer, with the purpose of restoring clarity and evening out the tone. Overall, I was highly impressed with the group of products. The quality of the products is exemplary, and while the price may seem a bit steep, a little goes a long way with each of them, so it's sure to last for quite a while. And with Mother's Day just around the corner (May 10th, people! ), I'm sure it will put a smile on your moms face (re: my mom is already using the shower cleanser and hand cream daily, and has been loving them). 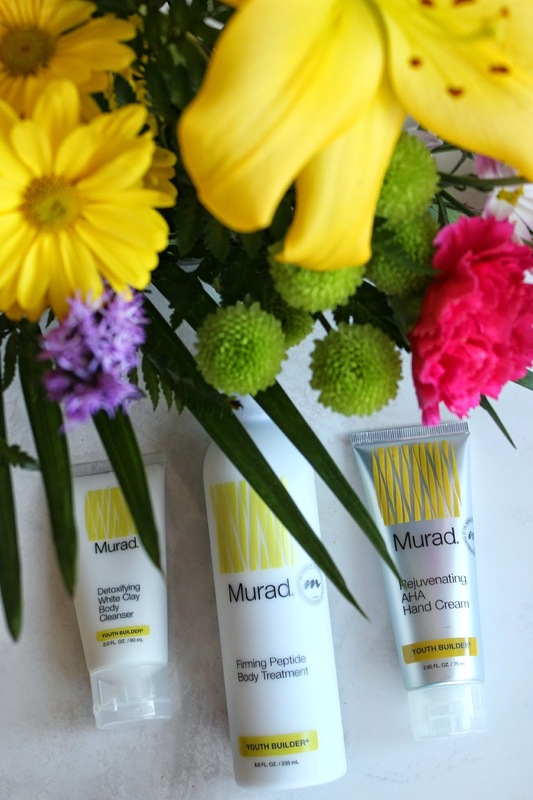 Have you tried anything from the Murad skincare line? What are your thoughts?